← Rats eating GMO corn get tumors and die early, are we next? Feed me, Seymour! Are you feeding cancer cells? Here’s a thought. If cancer was a wild fire, would you add more fuel to it so it would never go out? 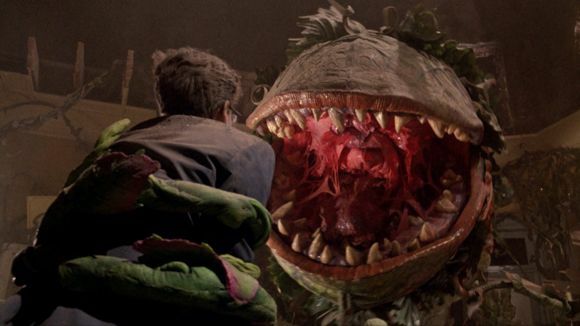 How about if it was a vicious plant (think Little Shop of Horrors), would you consistently water it so it would flourish? Probably not. Well remember that time I talked about high-fructose corn syrup being bad? Well guess what, it still is. In case my first post didn’t stick, here’s some more insight. Besides from containing Mercury, a carcinogen, its shown that CANCER CELLS FEED ON high-fructose corn syrup after it metabolizes through the liver. You may say so what, isn’t sugar (glucose) just as bad? NO. Although sugar is not good for our health either, our bodies metabolize glucose (sugar) and fructose (HFC) differently. It has been shown that tumor cells use FRUCTOSE for cell division and to speed up tumor growth over that of glucose. “This cancer-feeding fructose is what the majority of Americans are consuming on a daily basis, to the point where high-fructose corn syrup is their number one source of calories,” explains this article from Green Med. This is effective our children too. Kids are consuming sugar in excess through juice boxes, candy, and even ‘healthy’ sports beverages. Extreme huh? Well we consume 150 grams of sugar each day; whereas, many experts believe that the number should be around 15 grams per day or lower to prevent cancer. Although we don’t think we are literally opening cancers mouth and feeding it, we are. As cancer rates in this country are on the rise it is crucial we make the dietary changes necessary to stop it before its too late. It drives me crazy to see people ingesting these things left and right with no awareness to what it is doing to them. Again, natural sweeteners like Stevia or honey are GREAT substitutes with low calories that are shown to PREVENT diseases.